If I close my eyes I can vividly remember my first visit to the colorful city of Barcelona on Spain’s coast. Much like Catalan artist and architect, Antoni Gaudi’s work–the city seems to take on this whimsical air where every corner is vibrant with color, bursting with life and rich in flavor. 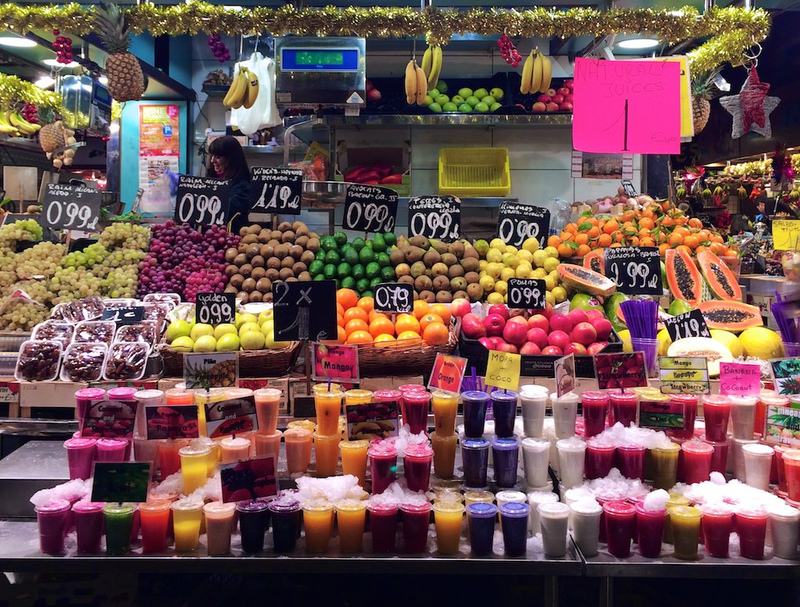 From tapas and wine to the sights of La Rambla, to Gaudi’s Parc Güell, La Sagrada Familia and Casa Batlló to the food of Mercat de la Boqueria; the things to be seen in Barcelona are endless. If headed on holiday to Spain, the following are the must have experiences for every traveler. 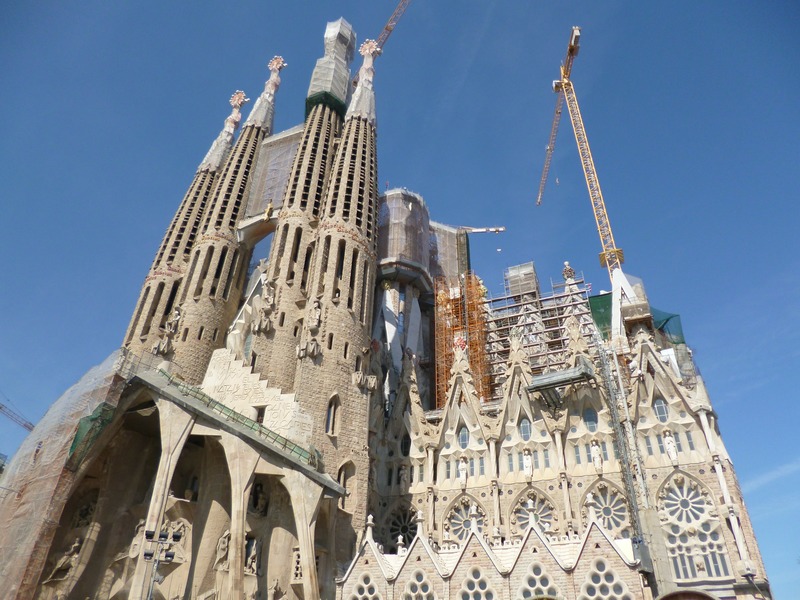 La Sagrada Familia is an ongoing project that Gaudi got involved with in 1883 and has a projected completion date of 2026 (the centenary of Gaudi’s death). What makes this basilica so unique is the incredible detail that adorns its facades–in particular there are three grand facades that each depict a religious scene: the nativity, passion and glory. In typical Gaudi style, each facade is dripping with symbolism and incorporates nature and animals to represent the larger religous concepts. At the base of porticos sits a large stone turtle or tortoise–subtle nods to represent either the land or sea. La Sagrada Familia is an incredible sight that truly attests to Gaudi’s immense talent, whimsy and knack for symbolism. You can visit La Sagrada Familia and simply take in the splendor of its exterior, or look to have a guided tour of its interior. Learn more about visiting this iconic sight here. Stalls are stacked against each other–some spilling over with colorfully wrapped candies and rich brown chocolates tempting the palates of those who pass by. Others show a brilliant display of fruits hanging from the ceiling, lined in wicker baskets, whipped up in fruit smoothies–hot pink, fiery red, bright orange; the fruit stand looking like a box of Crayola crayons. Mercat de la Boqueria is the public market in Barcelona and a magnet for all visitors looking to submerge themselves in the local flavors of Spain’s culinary scene. Another example of Gaudi’s imagination come to life, Casa Batlló is nestled in the heart of Barcelona and translates to “House of Bones” because of its skeletal like detail in the architecture. The building features classic Gaudi mosaic, detail and facades with–most notably–a roof that is arched and covered in blue and green mosaic to look like the writhing back of a dragon. Like a fun house of artful twists and turns, the front of Casa Batlló invokes the feel of a serene ocean while the interior is surprising and–of course–whimsical. Anyone walking by can snap photos of Casa Batlló and its unique front but to really get a feel for one of Gaudi’s best works, you can visit the museum and get a tour of the inside and roof. When I reflect back on my visit to Spain, it is Parc Güell that stands out in my mind as being my absolute favorite place to visit while in Barcelona. 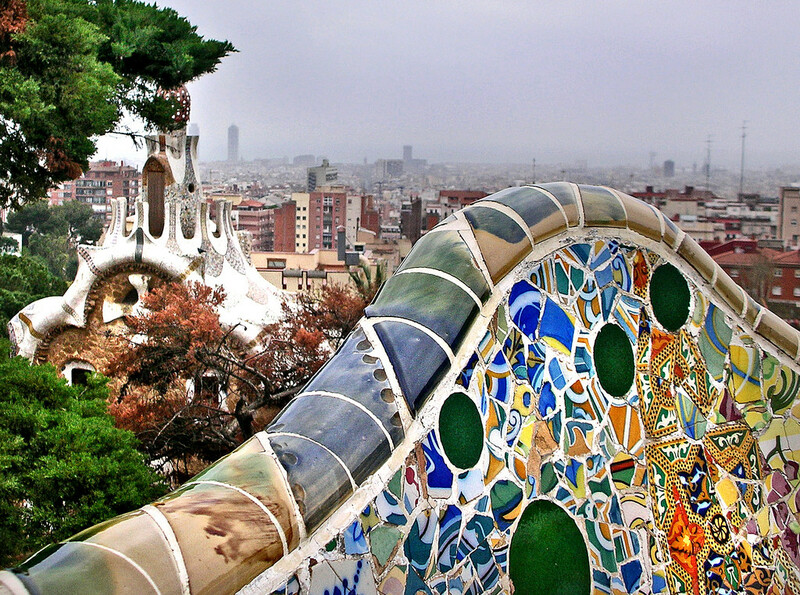 The park is made up of gardens and Gaudi elements that all overlook greater Barcelona from up on top of Carmel Hill. I remember standing in the park amidst the iconic, mosaic sea serpent benches and falling in love with the color, the warmth of the city and the Spanish guitar playing from nearby musicians. 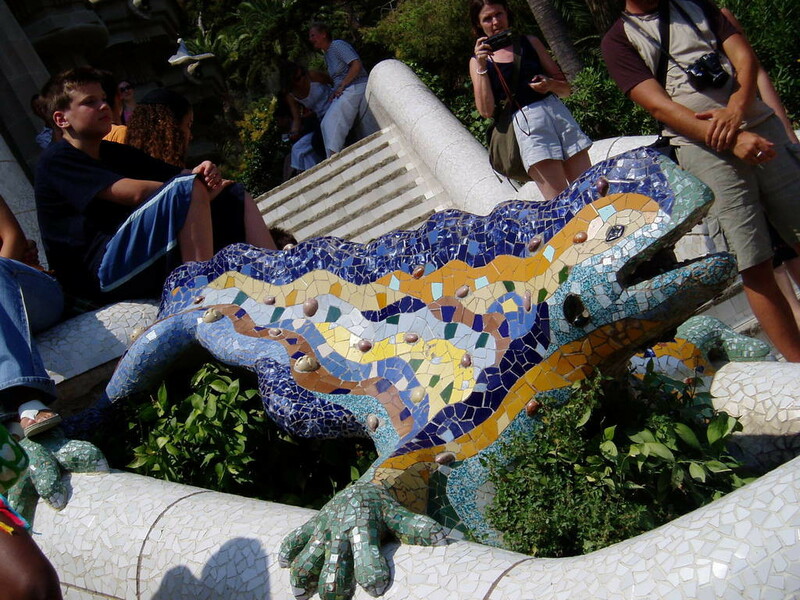 Perhaps the most notable thing in the park is Gaudi’s dragon that sits prominently at the entrance with hues of blue, turquoise, yellow and green mosaic. Your turn! Share your comments, stories and tips on things to do in Barcelona below! 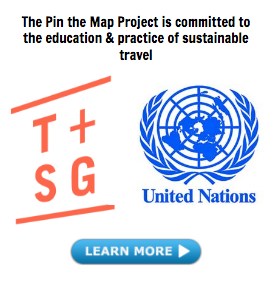 **This post was contributed to The Pin the Map Project by First Choice UK. Great post. I like how you offered La Boqueria and Las Ramblas as separate destinations; because while “technically” in the same area they deserve their own attention! Love, love Barcelona too. The warm summer weather there sounds lovely right now. 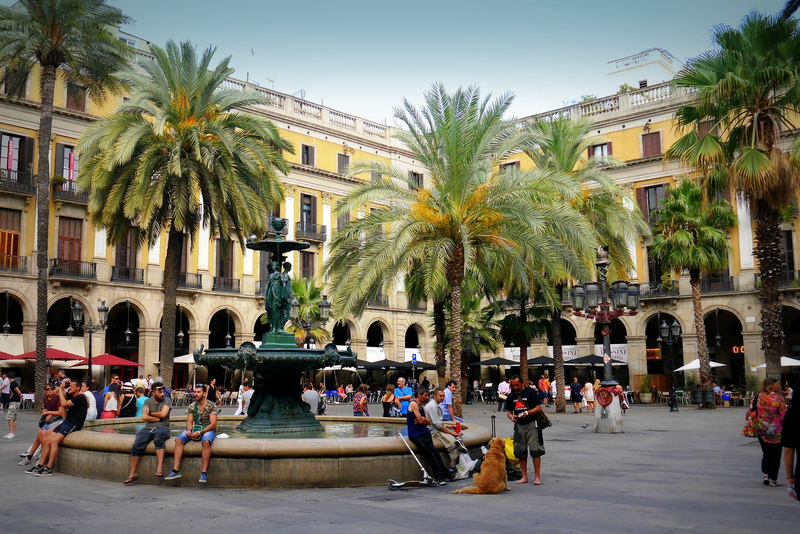 I loved my visit to Barcelona, from the weather to the architecture to the food. And there’s so much to do! One thing to add for first time travelers (and something my friends from Barcelona warned me about): be sure to keep a close eye on your personal belongings at all times. Barcelona is the land of professional pick-pocketing. If you set down your purse or leave your phone on an outdoor table, it could be scooped up without your noticing. 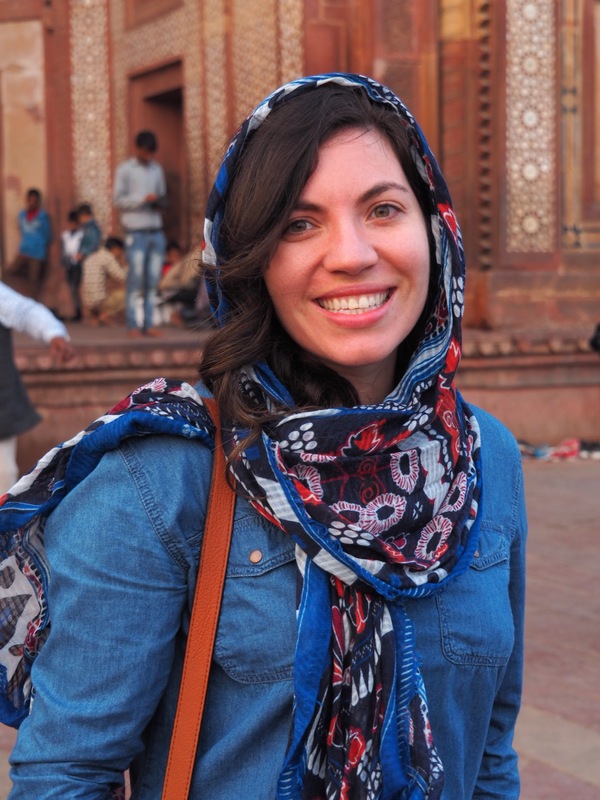 Really good, practical tip to share and something to be wary of when traveling in general. Thanks for reading! Have so much fun in Barcelona! It is one of my favorite cities 🙂 When are you headed there? How exciting! Have an amazing time!! I’ll be headed back to Barcelona in August during a tour of Europe. 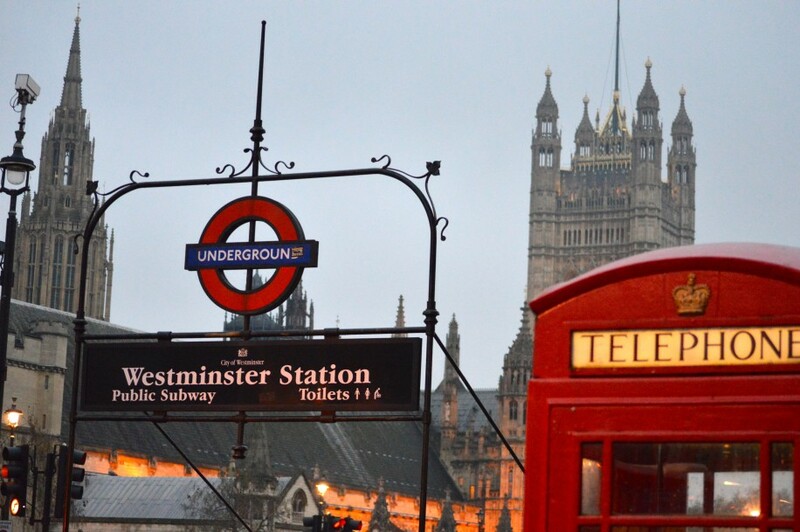 Looking forward to going back. Going to remember this list, want to go to Barcelona any time soon! I’m going to reference this when I stop in prior to TBEX! Great tips, would love to visit Barcelona, looks like a beautiful city! Amazing! Let me know how your trip goes!